Considering enthusiastic partygoers tend to stay away from walls, mingling, and dancing non-stop, the idea of a Party Wall might seem like a confusing contradiction. But head to MoMA PS1 in Long Island City — trust us, it's an easier trip than you think and it's well worth it — and you'll be surprised. 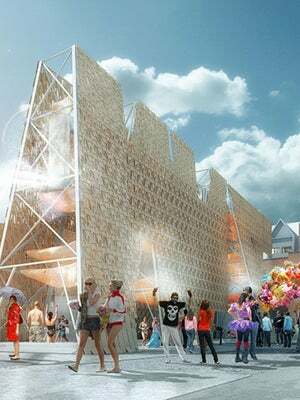 Party Wall is the winning project of this year's Young Architects Program at MoMA and MoMA PS1. Designed by CODA — Caroline O'Donnell of Ithaca, New York — the outdoor installation is complex, creative, environmentally conscious, convertible, and practical. Quite the combo, we'd say. The large-scale linear structure provides shade for those walking beneath and/or through it. Reclaimed wood at its base creates a series of micro-stages for performances. Pools of water serve as refreshing cooling stations. Party Wall also acts as an aqueduct by carrying a stream of water along the top of the structure and projecting it, via a pressure-tank, into a fountain that feeds a misting station and a series of pools. As if that wasn't enough, 120 of the installations lowest exterior panels can be detached and used as benches and communal tables. Party Wall is open until August 31. Take full advantage by scheduling your trip on a Saturday to coincide with the museum's Warm Up 2013 concert series. Because outdoor concerts + art = the perfect summer afternoon. When: Thursdays through Mondays, from noon to 6 p.m.
Where: MoMA PS1, 22-25 Jackson Avenue (at 46th Avenue), Long Island City; 718-784-2084.